Due to popular demand, The Fireworks Firm is delighted to add Sky Lanterns to our range of products. 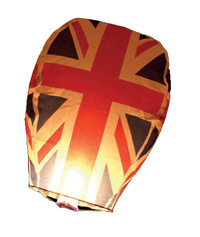 The distinctive and eye catching Union Jack design Sky Lantern, will be available to buy in store and online. - All of our Sky Lanterns are 100% wire free, in addition to being biodegradable, which makes them the most environmentally friendly Sky Lanterns available anywhere in the world.